Robert Gerhart received his BFA from Pratt Institute in New York in 1965, and his MFA from Temple University, Tyler School of Art in 1969. He taught at Dayton Art Institute from 1969-1973. Gerhart spent the remainder of his teaching career with the Department of Art at the University of North Carolina at Greensboro (UNCG) until his retirement in 2007. While at UNCG, he instructed drawing, painting, design, color theory, and etching. His students included Jessica Sims, Robert Igoe, James Williams, and Chi-Kit Kwong, whose works are included in the Weaver Art Collection. 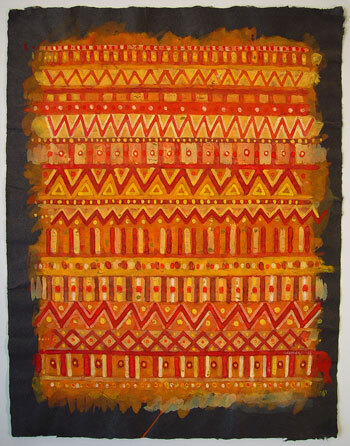 Much of Gerhart’s work is based on geometric systems and patterns. As an abstract painter, he is conscious of two primary phases defining the process of making his work. “One is establishing an approach to building a basic underpinning or structure which gives the work a starting point. This ‘foundation’ is necessary in order to purposefully roam through the second phase which invents the shapes, colors, etc. of the painting or drawing.” Gerhart’s numerous exhibitions include shows in New York City, Oregon, Chicago, and many times in Art On Paper at the Weatherspoon Art Museum.